Iwona and Arek are having their 20th wedding anniversary this year, and I encouraged them to do a photography session to celebrate it. They didn’t have any professional pictures taken on their wedding day so I thought this would be a perfect opportunity to capture their love 20 years later. It can be a challenge for someone to look relaxed and natural in front of the camera if they aren’t a professional model or if they’re not used to it. 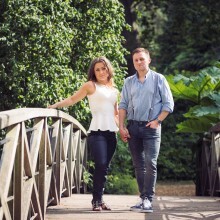 It is often down to the photographer to put the couple at ease and get them to smile and relax. It is usually easier with girls as they know how to look pretty and enjoy posing. With guys, it can be more challenging as they don’t want to do overly complicated poses and some might even think that posing is too feminine :). 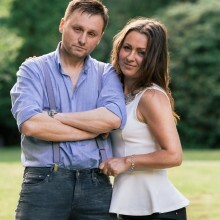 Offering some coaching can help, for example, showing them what to do with their hands and just allowing the couple to interact with one another. Usually they quickly discover that by simply paying attention to a few details, posing can be really simple and eventually (usually after the first setup/location) the ice breaks and we can roll on with the photoshoot. We had a great time at the portrait session and my models 😉 did brilliantly on the day. 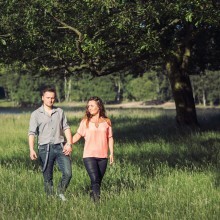 Iwona and Arek can proudly tell the story that bystanders were thinking that this was their actual engagment session. They were astonished to find out that this is their 20th wedding anniversary. 🙂 Indeed, they don’t look like they have 20 years worth of marriage experience. Engagements, or post-wedding sessions are fun, but there is also something timeless about capturing a couple’s love years down the line. It’s easy to get married but staying married is the real challenge. 🙂 Well done guys. I’m proud of you sister.